Birds Choice 22 x 22 Seed Catcher Open Platform Review – Birds Love It! Platform feeders come in a variety of different forms. There are some that you can hang in trees or hooks placed either high or low. Some platform or tray feeders are called open feeders because there is no roof or shelter for it. While other types of platform feeders do have a roof on them which helps shelter the birds from rain and snow. While the shelter is nice to have it does limit certain bigger birds from getting on it. So it all depends on what you prefer to attract to your backyard feeding station. Personally, I like the open type platform feeder as I want to attract both the smaller birds like carolina wrens, cardinals, finches, and chickadees but also the larger birds such as the cooper’s and red-tailed hawks and pileated woodpeckers. This open platform feeder or bird table as some call it, does the trick for me. This large platform feeder is attached to a pole that you place in the ground and is very sturdy. With the product dimensions of 22 x 22 x 3 it makes it a pretty good size too. 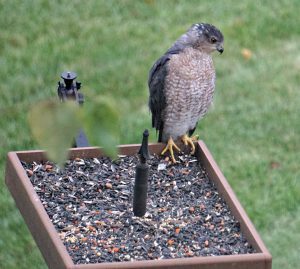 The size helps keep the seed on the tray as opposed to falling on the ground from messy birds. It provides them with more space to move around to get to the food. The base or bottom where you place the seed, is made up of a perforated screen so that rain water just flows through it and does not collect in the tray. The base is made up of a high grade cedar. The other good benefit with this platform feeder is that you can put a variety of different types of wild bird food in the tray which insures that you will get the mixed varieties of bird species. For example, I generally put a premium bird seed mix with fruit and nuts in the tray and sometimes will add raisins and cherries for an extra delight for the songbirds and woodpeckers. In the winter time, I will also add suet in the feeder as an extra treat. By doing this I will be able to count on many songbirds, woodpeckers, jays, and hawks to visit frequently to my feeders which is what I want. With this platform feeder many birds can be on it at once too, both large and small. 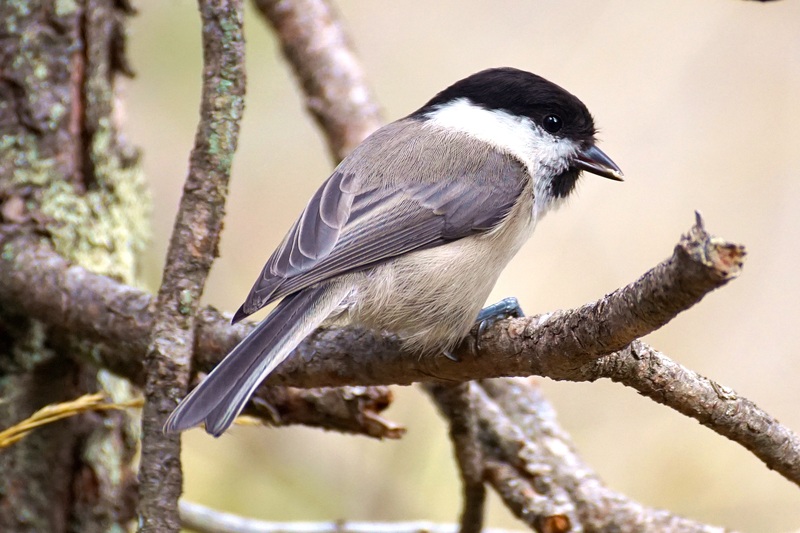 On the smaller feeders, birds will tend to harass other birds from getting on it because they want the seeds for themselves. While that can happen on the platform feeder too, it is less likely. If a bigger bird like the mourning dove is tormenting another bird such as the carolina wren, the wren can just relocate to the other side of the platform away from the aggressive dove. Problem solved! I have had the Pileated Woodpecker on my platform feeder plenty of times which is about the size of a crow and have also had Cooper’s hawks and Red-tailed hawks too (see photo on left). These birds are always fascinating to see. You will not get these bigger birds on the smaller feeders with the exception of the suet feeder. The Pileated will get on that. However Here is A Word of Caution: the hawks are coming in for only one thing…other birds to eat, such as doves. If that does not bother you then you are in for a real treat. Additionally, the hawk doesn’t always get the bird anyway, as seen in this photo. It is resting there because it missed the dove! Yes, some people will think that this is cruel and unusual punishment, but it is just a part of nature. Hawks and Owls eat mammals and other birds. All you do is take out the screens and clean them every so often which is good for the health of the birds. The screens come out easy enough and you just spray them down with a hose or wipe down with a clean cloth and insert them back in. In Conclusion, I highly recommend this product if you want to have added entertainment while you are relaxing in your back yard. Watching all the bird activity is always fun and enjoyable and sometimes can get pretty exciting too. Especially when that red tailed hawk comes flying in to try to get the doves. The doves all take off making their sharp whistling or whinnying sound and scattering everywhere to get away from their attacker. It is an action packed scene that you will not want to miss. The platform feeder is also easy to clean. All you have to do is take out the screen, wipe it clean and reinsert it. Pretty easy! Plus the feeder will last a long time. We have had ours for ten years or more and it still looks pretty good and is in great shape. On a side note, I did not mention this earlier, but I would definitely purchase a squirrel guard to go with this feeder as it will keep the pesky critters out of it such as squirrels and even raccoons. If you do not have one of these guards, these guys will get in there and just eat up all of the food in the feeder in one sitting. They are pigs. That can get pretty expensive over time. This product is only shipped in the United States and if you are a Prime Member on Amazon, you can have it shipped to you within just a few days and shipping is Free. I hope that you enjoyed this review and if you have any questions about the Birds Choice 22×22 Seed Catcher Open Platform Feeder or want to leave your own personal review, leave a comment below. I would greatly appreciate it. Wow this seems like a great way to feed wild birds. I usually feed birds in winter. I live in Sweden and during winter when it is cold, some birds have problems finding enough to eat, especially if snow covers the ground. When smaller birds don’t get enough to eat they usually freeze to death. It is a delight to see different kind of birds in the garden and this platform seem like a great way to attract different kinds of birds. It is a pity that it is only sold in the US. I’m sure that you can purchase something similar in Sweden. If you are only feeding the birds in the winter you might want to think about providing suet for them. Suet usually contains fat (such as peanut butter) and is a high energy food which is especially good for the birds in the winter. Thanks for your comment. Just wondering what types of birds do you get in Sweden? Hi! Thanks so much for introducing me to this platform feeder. For years, I’ve been wanting to get one for the bigger birds, but I never thought it would be beneficial for the smaller birds too. I can see you point that it would prevent them from fighting. My only concern is every bird lovers nightmare – squirrels! How would you keep them away from the feeder? Additionally, that is not my only feeder. I have different feeders set out for the smaller birds if the bigger ones seem to take over. That really helps a lot. I am an avid bird watcher and love to watch the birds in my backyard when I am having my coffee in the morning. I normally use the small bird feeders you hang in the tree, but the open platform feeder is a great alternative. I think I am definitely going to invest in one soon. I also love the option that you can clean it so easily. Should I pour just a little seed mix several times a day or can I add enough only once to last for the day? What do you recommend?